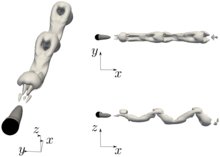 A fully three-dimensional linear stability analysis is carried out to investigate the unstable bifurcations of a compressible viscous fluid past a sphere. A time-stepper technique is used to compute both equilibrium states and leading eigenmodes. In agreement with previous studies, the numerical results reveal a regular bifurcation under the action of a steady mode and a supercritical Hopf bifurcation that causes the onset of unsteadiness but also illustrate the limitations of previous linear approaches, based on parallel and axisymmetric base flow assumptions, or weakly nonlinear theories. The evolution of the unstable bifurcations is investigated up to low-supersonic speeds. For increasing Mach numbers, the thresholds move towards higher Reynolds numbers. The unsteady fluctuations are weakened and an axisymmetrization of the base flow occurs. For a sufficiently high Reynolds number, the regular bifurcation disappears and the flow directly passes from an unsteady planar-symmetric solution to a stationary axisymmetric stable one when the Mach number is increased. A stability map is drawn by tracking the bifurcation boundaries for different Reynolds and Mach numbers. When supersonic conditions are reached, the flow becomes globally stable and switches to a noise-amplifier system. A continuous Gaussian white noise forcing is applied in front of the shock to examine the convective nature of the flow. A Fourier analysis and a dynamic mode decomposition show a modal response that recalls that of the incompressible unsteady cases. Although transition in the wake does not occur for the chosen Reynolds number and forcing amplitude, this suggests a link between subsonic and supersonic dynamics.